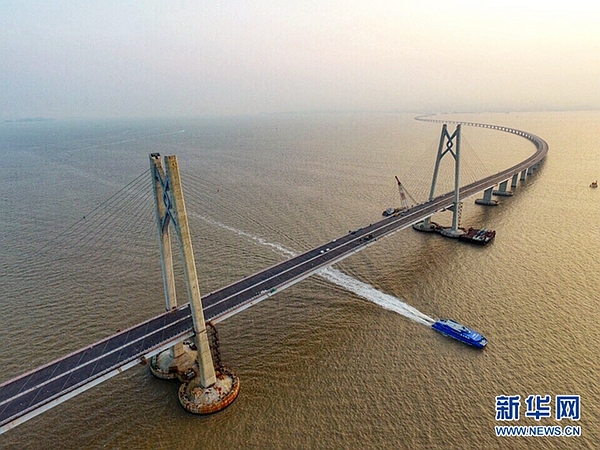 The building of the Guangdong-Hong Kong-Macao Greater Bay Area city cluster has drawn world-wide attention since it was mentioned in the 2017 Report on Government Work. The Greater Bay Area will include the Hong Kong Special Administrative Region, Macao Special Administrative Region, and nine neighboring cities in Guangdong Province, namely Guangzhou, Shenzhen, Zhuhai, Dongguan, Huizhou, Zhongshan, Foshan, Zhaoqing and Jiangmen. Although they account for only about 0.6 percent of the country's land area, together they create about 12.4 percent of the country's total economic output at present. Thanks to the economic pioneering work of Hong Kong and Macao, and the rapid development of the Pearl River Delta since the reform and opening-up was launched at the end of the 1970s, the Greater Bay Area has achieved great economic strength with significant complementarities between these areas. The top bay areas in the world, such as that adjacent to New York and San Francisco, and the Tokyo Bay Area, feature developed service industries, and form major global financial centers and transportation junctions. Since China's Greater Bay Area initiative was launched, high hopes have been placed on it becoming a world-class city cluster. Presently, the Greater Bay Area city cluster enjoys special development favors. When completed, it will promote rapid economic development locally through a complementary effect existing on all sides. At the same time, it lays a solid foundation for further cooperation between China's inland cities and Hong Kong and Macao. Objectively, however, compared with the other city clusters mentioned earlier, the Greater Bay Area faces more challenges and obstacles mainly stemming from the existing systems. Whether these obstacles can be removed one by one to realize real and effective economic interconnectivity is an important prerequisite for the project’s success. There are several points that are worth noting. First, we should break regional monopolies and administrative barriers in the building of the city cluster so as to form genuine all-round interconnectivity. In the case of competition between regions, the short-term departmentalism, namely working solely in one’s own interests at the expense of wider considerations, can often lead to something like the "prisoner’s dilemma." Particularly for such a newly-emerging city cluster as the Greater Bay Area, it involves not only nine mainland cities, but also Hong Kong and Macao special administrative regions. So, how to rationally integrate the decisive role of the market with the guiding role of the government is a big problem not easy to solve in the overall development. Second, we should form a coordinated industrial division of labor and layout conforming to both the present comparative advantages of the various parties, and take into account the requirements of long-term industrial reform and upgrading. Objectively, the three regions have their own advantages and disadvantages. Hong Kong has special advantages in the talent resource market, science and technology and finance; the Pearl River Delta has made outstanding achievements in manufacturing and the development of some emerging industries; meanwhile, the market in Macao needs further exploration and reform to fulfill its potential. On the basis of their respective advantageous industries, the three regions need to learn from each other, seek both the combination and division of industries and create new economic modes, so as to gradually achieve a transformation to high-end manufacturing, high-tech industry, high-end finance, and an advanced service industry. Third, we should break through a series of system obstacles and build a regional coordinated development mechanism. The Greater Bay Area involves nine cities in the Pearl River Delta plus Hong Kong and Macao to form a particular "9+2" model going beyond any previous city cluster model. It will be operated in accordance with the principle of "one country, two systems," under which effective coordination between different laws, different administrative systems and different tariff systems must be realized to promote regional integration, and maintain long-term prosperity of the Greater Bay Area. The free circulation of talent, science and technology, and funds between the three groups requires not only normalization of a coordinated mechanism, but also unified and coordinated planning from the central government. The future of the Guangdong-Hong Kong-Macao Greater Bay Area city cluster is promising, but in order to build it into the world's most competitive entity of its kind, top priority must be given to clearing away all the obstacles to genuine regional development in which all contribute and benefit equally. There is no clear answer at present, but China's rapid development in the past four decades demonstrates that, to make the economy take off, we need to adhere to the reform and opening-up policy, make constant breakthroughs that eliminate ideological constraints, and eliminate the shortcomings of the existing system. In fact, the Greater Bay Area has set a very good example already. It is precisely because of the reform and opening-up policy that the Pearl River Delta has witnessed economic miracles and Hong Kong and Macao have achieved great prosperity. Therefore, as long as we insist on reform and opening-up to the outside world and remove obstructions along the development road, the Greater Bay Area will certainly be built into a world-class city cluster providing strong support for the Chinese economy. The author is a researcher with the National Academy of Development and Strategy of the Renmin University of China. The article was translated by Li Jingrong from an unabridged version published in Chinese. The future of the Guangdong-Hong Kong-Macao Greater Bay Area city cluster is promising; yet it first needs to clear away all the obstacles to coordinated regional development.